1. 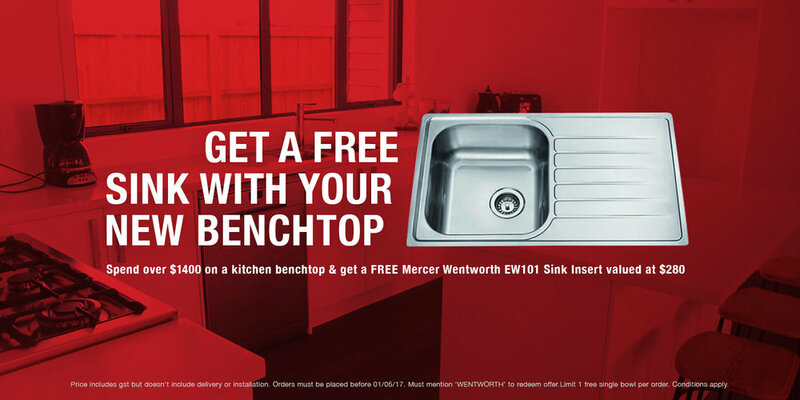 Receive a free Mercer Wentworth EW101 single bowl when you spend $1400 or over on a kitchen benchtop. 2. Price includes gst but doesn’t include delivery or installation. 3. Orders must be placed before 01/05/17 and must be delivered before 01/08/17. 4. You must mention ‘WENTWORTH’ in your order to redeem the offer. 5. Limit of 1 free single bowl per order. 6. Sink insert can be upgraded to a Mercer Wentworth EW201 one and a quarter bowl with drainer for $45.